Stroller Warriors initiated a mileage campaign in 2011 with "Ran to Afghanistan" to encourage our participants to set an annual mileage goal, record the miles, and help our team complete a virtual relay to Afghanistan (about 7,000 miles from our headquarters at Camp Lejeune, NC). We've had troops on the ground in Afghanistan for many years and this program was a way for Stroller Warriors to not only show our support, but encourage our membership to reach big goals as well. The premise was simple – when Stephanie first started the campaign she calculated the number of miles it is from our headquarters at Camp Lejeune to Afghanistan. Then she divided that number of miles by 30 members (about the number of members we had regularly attending workouts at that time) and came up with 250 miles. So basically, if we had 30 members run 250 miles each they could reach Afghanistan as a team. The team not only reached Afghanistan, they ran there and back several times! In 2014, we extended the program to a global effort, engaging the participation of friends, family, fans, and alumni Stroller Warriors around the world. The program has helped countless people reach running goals that they never dreamed they could achieve. The program evolved in 2015 to include a new theme and logo, "Run the World with Stroller Warriors." Although we all have individual goals/milestones, our program participants around the world will count their mileage as we try to reach a total of 74,087 miles...the distance from SW chapter to SW chapter in the order that the SW chapters were launched. As we launch new chapters in 2015 we will add them to the list. All our chapters are participating, uniting our members worldwide in one awesome effort! In 2016, we will pick up where we left off in 2015, continuing our worldwide relay and setting our goals even higher. This program continues to support our deployed troops by supporting and bonding their families back home. We are excited to continue to offer this valuable program not only to our members but to our friends and family as well. It's not too late to get started...print the sheet and start tracking today! 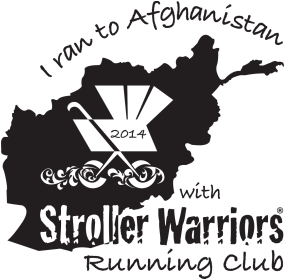 We want to extend a big thank you to Stroller Warrior Christina H for designing our "Ran to Afghanistan" logo and for Stroller Warrior graphic designer Shannon S for designing our "Run the World" logo. Click the link below to view the archive of our prior finishers. 2014 Finishers for "Ran to Afghanistan"
2015 Finishers for "Run the World"